Can the Bank Make Deposits to the Wrong Account? What Happens If the Bank Makes a Deposit Into the Wrong Account? Mistakes happen in any business, and banks are no exception. Although it's unlikely, it is possible for a deposit to be mistakenly credited to the wrong person’s checking account. When this happens, the bank will reverse the transaction and credit it to the correct account, but it can affect a number of things. Most importantly, you should never assume the money is yours and spend it. Here's what to do if money is accidentally deposited into your account. What If My Money Went Into the Wrong Account? You should make it a habit to check your bank balance daily. Many banks even have apps that show you a real-time update of your money (like PNC Bank's Virtual Wallet), so you know exactly where you stand at all times. If your deposit went to the wrong account, you should notice that your bank balance is lower than it should be. Catching this type of error up front will prevent you from having to deal with the expenses of returned checks or overdraft fees, which can add up significantly over days or weeks. As soon as you realize the error, contact your bank and explain what happened. 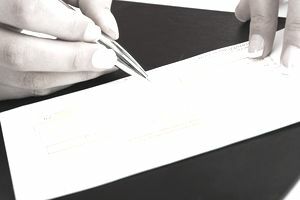 The bank will likely need a copy of your receipt so that they have a transaction number to begin looking into the issue, so it's a good idea to keep all bank receipts until you are sure the transaction cleared. Once the bank has gathered the necessary info regarding the erroneous deposit, they can reverse the transaction and credit you back the money. They may also be willing to reverse some fees if you overdrew due to this happening. However, that is at the discretion of the bank – but it never hurts to ask. While this is a frustrating situation, it helps to be polite and stay calm. What If Money Unexpectedly Shows Up in My Account? It's important to note that when the bank discovers the mistake, they will reverse the transaction, even if it means that your account goes into the negative. If you spent any of this money, you will be responsible for paying it back. In some cases, and if the amount is large enough, you could also face criminal charges for spending money that isn't yours. How Can I Catch Mistakes? It is essential that you balance your checkbook or check your actual account balance on a regular basis. This can help you detect any discrepancies with your account, whether it be an accidental deposit to your account, an erroneous charge, or another issue. There is a limit on how long you have to report these types of errors, which makes it even more important that you check your accounts on a regular basis. The same rule applies to your credit cards. It can be tempting to just pay the amount due and to ignore the rest of the information on your credit card statement, but it is your responsibility to make sure the charges are correct. It can save you a lot of money if you catch a mistake before it becomes serious. Is Checking My Balance at the ATM Enough? It is not enough to simply check your balance at the ATM. The balance may not be your actual balance since you do not know which items have cleared and which haven't. Scheduling just five minutes a day to check your account balance and ensure all charges are correct is all it takes to stay on top of the money you actually have in your account. You can also check off items once they have cleared your account. This allows you to monitor your actual balance and can prevent you from overdrawing your account. It can also help you catch erroneous transactions, like an incorrect deposit. This can also be beneficial to detect both fraudulent charges or an unexpected credit to your account. Updated by Rachel Morgan Cautero. What Is a ChexSystems Report and How Can I Fix It? Hold Time for an Out-Of-State Check: When Will You Get Your Money? What If I Find an Unauthorized Transaction on My Bank Account? Lost a Check in the Mail? Here's What You Should Do. Do You Know How Much Money You Actually Have in Your Checking Account?